Let's back up and level-set. Blazor is a single-page app framework for building interactive client-side Web apps with .NET. Blazor uses open web standards without plugins or code transpilation. Blazor works in all modern web browsers, including mobile browsers. The .NET code runs inside the context of WebAssembly. You're running "a .NET" inside your browser on the client-side with no plugins, no Silverlight, Java, Flash, just open web standards. WebAssembly is a compact bytecode format optimized for fast download and maximum execution speed. Here's a great diagram from the Blazor docs. Here's where it could get a little confusing. 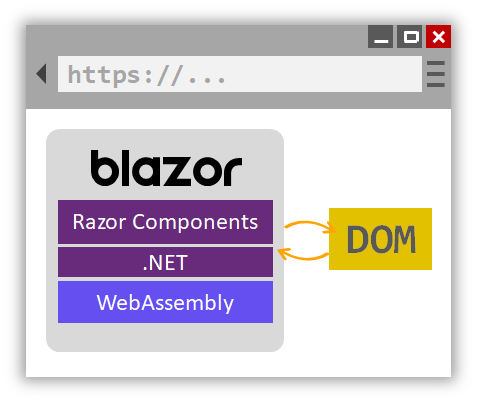 Blazor is the client-side hosting model for Razor Components. I can write Razor Components. I can host them on the server or host them on the client with Blazor. You may have written Razor in the past in .cshtml files, or more recently in .razor files. You can create and share components using Razor - which is a mix of standard C# and standard HTML, and you can host these Razor Components on either the client or the server. In this diagram from the docs you can see that the Razor Components are running on the Server and SignalR (over Web Sockets, etc) is remoting them and updating the DOM on the client. 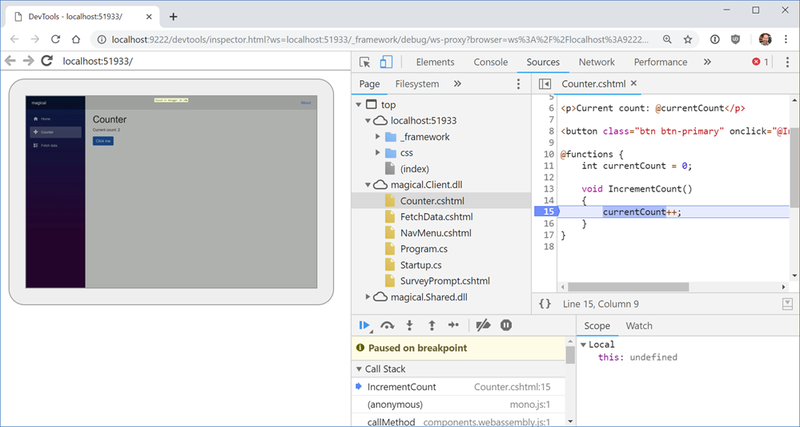 This doesn't require Web Assembly on the client, the .NET code runs in the .NET Core CLR (Common Language Runtime) and has full compatibility - you can do anything you'd like as you are not longer limited by the browser's sandbox. Razor Components decouples component rendering logic from how UI updates are applied. ASP.NET Core Razor Components in .NET Core 3.0 adds support for hosting Razor Components on the server in an ASP.NET Core app. 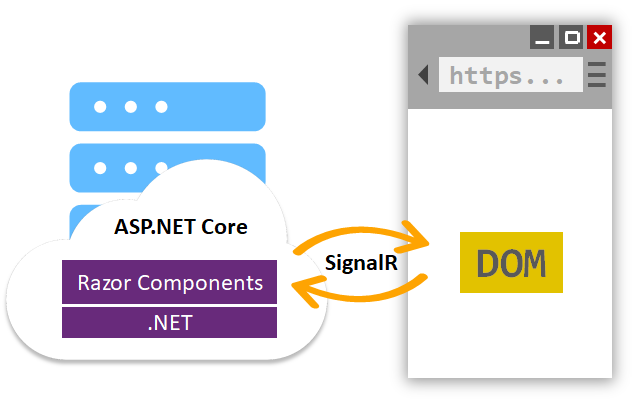 UI updates are handled over a SignalR connection. Here's the canonical "click a button update some HTML" example. You can see this running entirely in the browser, with the C# .NET code running on the client side. .NET DLLs (assemblies) are downloaded and executed by the CLR that's been compiled into WASM and running entirely in the context of the browser. Note also that I'm stopped at a BREAKPOINT in C# code, except the code is running in the browser and mapped back into JS/WASM world. It's a pretty exciting time on the open web. There's a lot of great work happening in this space and I'm very interesting to see how frameworks like Razor Components/Blazor and Phoenix LiveView change (or don't) how we write apps for the web. 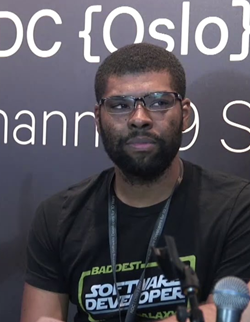 David Fowler is the ASP.NET Core Architect (and an amazing highly technical public speaker) and I've learned a lot from watching him code. However, what's the best way for YOU to learn from folks like David if you can't sit on their shoulder? Why, look at their GitHub! Even more interestingly, we can look at David's github here https://github.com/davidfowl and then under Repositories see what he's up to, filter by language and type, and explore! Sometimes I just explore the Pull Requests on projects like ASP.NET Core. You can have Private repositories on GitHub, as I do, and as I'm sure David does. But GitHub is a social network for code and it's more fun and a better learning experience when we can see each others code and read it. Read with a critical eye, but without judgment as you may not have all the context that the author does. If you went to my GitHub, https://github.com/shanselman you might be disappointed but you also may be missing the big picture. Just consider that as you Follow people and explore their code. David is an advanced .NET developer, while, for example, I am comparatively intermediate. So I realize that not all of David's code is FOR me. It's a scratchpad, it's not educational how-to workshops. However, I can get pick up cool idioms, interesting directions the tech may be going, and more importantly - prototypes and spikes. Spikes are folks testing out technical ideas. They may not be complete. In fact, they may never be complete. But some my be harbingers of things to come. Here's a few things I learned today. That sounds cool! I can go learn that gRPC is a modern (google sponsored) Remote Procedure Call framework that can run anywhere. It's used by Netflix and Square and supports basically any languaige and any environment. Nice for this microservice world we are entering and hopefully has learned from the sins of DCOM and CORBA and RMI, because I was there and it sucked. This Web.Framework sounds fun, and I'll be sure to take the description to heart. It's a small change but it also makes me feel good about the API underneath this new JSON API that's coming. My takeway is that it's not as scary as I'd assumed. Looks like a Good Thing(tm). 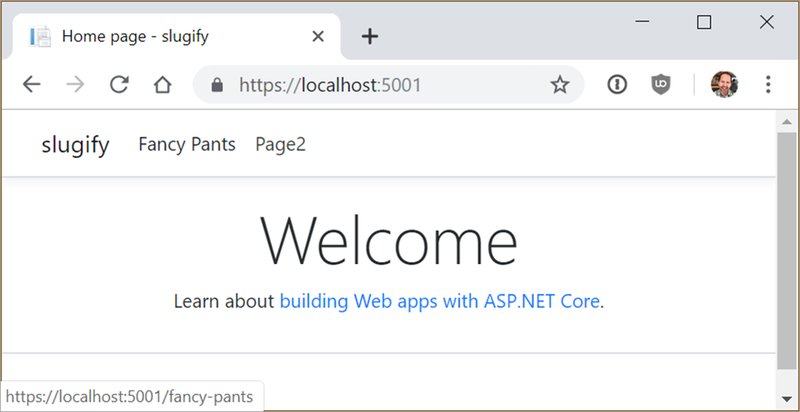 "The following sample shows how you can host a TCP server and HTTP server in the same ASP.NET Core application. Under the covers, it's the same server (Kestrel) running different protocols on different ports. The ConnectionHandler is a new primitive introduced in ASP.NET Core 2.1 to support non-HTTP protocols." I didn't know you could do that! Looks like this sample hasn't changed much since it was conceived of in 2018, but then in the last month it's been updated twice and it appears to be part of a larger, slow-moving architectural issue called Bedrock that's moving forward. I learned that Kestral (the ASP.NET Core web server) has a "ListenLocalhost" option on its options object! I can see here that TCP port 8007 is customer and uses a custom ConnectionHandler which I also didn't know existed! I can then look at the implementation of that handler and it's cool how clean the API is. You can get the result cleanly off the Transport buffer. You're doing low-level TCP but it doesn't feel low level. Pretty slick. This just echos what is sent to that port but not only has it educated me about a thing I didn't know about, it's something I can mentally file away until I need it! All of these things I learned in just 30 minutes of exploring someone's public repository. 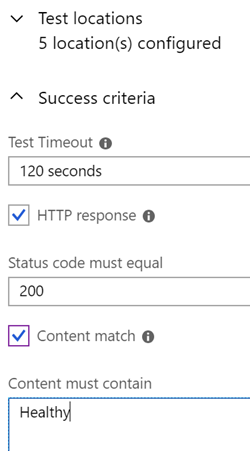 Earlier this week I talked about how I upgraded my podcast site to ASP.NET Core 2.2 and added Health Check features fairly easily. There's a ton of new features and so far it's been great running on my site with no issues. Upgrading from 2.1 is straightforward. After the IIS HTTP Server processes the request, the request is pushed into the ASP.NET Core middleware pipeline. The middleware pipeline handles the request and passes it on as an HttpContext instance to the app's logic. The app's response is passed back to IIS, which pushes it back out to the client that initiated the request. HTTP/2 is enabled by default. HTTP/2 may be sneaking up on you as for the most part "it just works." In ASP.NET Core's Kestral web server HTTP/2 is enabled by default over HTTPS. You can see here at both the command line and in Chrome I'm using HTTP/2 locally. Here's Chrome. Note the "h2." All in all, it's a solid release. 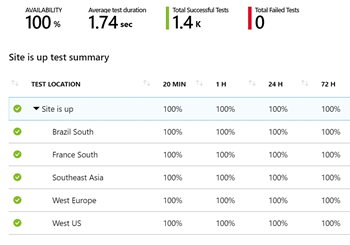 Go check out the announcement post on ASP.NET Core 2.2 for even more detail!